Thick concrete with rebar and steel cables. Extra tall pilings. And a roof meant to keep out the wind. 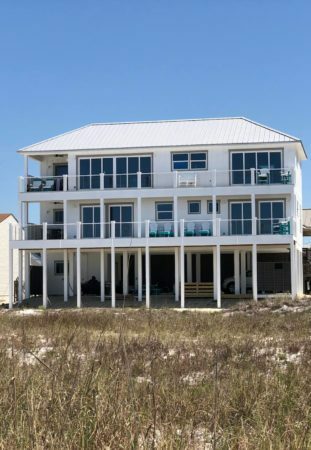 Those are the things that allowed one home in Mexico Beach, Florida, to remain standing even as Hurricane Michael obliterated most of its neighbors. The Sand Palace in Mexico Beach, Florida. The home, dubbed the “Sand Palace” by owners Russell King and his nephew Lebron Lackey, was built in 2017, the New York Times reported. The two men reportedly used the house as a family vacation getaway, and rented it out when not staying there themselves. According to the home’s Facebook page, it sleeps as many as 10 people, has four bedrooms, an elevator, and sweeping views of the ocean. King and Lackey, who did not immediately respond to Inman’s request for comment, told the Times that the home was built to withstand winds as high as 250 miles per hour — far above what was required by local Florida building codes that require homes to resist winds between 120 and 150 mph. They achieved that level of resilience by relying on durable materials and fortress-like construction. The walls are made of poured concrete reinforced with steel and rebar, the Times reported. The home’s Facebook page also states that it employs insulating concrete forms, or ICF, a construction method that involves stacking a series of modular units, sometimes made of polystyrene or other lightweight materials. The units interlock and are then filled with concrete. ICF construction emerged after WWII and involves pouring concrete in place at the construction site. It is generally more resistant to storms and other common household problems such as mold and pests than traditional wood construction. The Sand Palace also sits high above the ground on concrete pilings that keep it safe from flood water and storm surge. The concrete extends deep into the ground to anchor the building in place, and the roof reportedly is designed to block out wind so it can’t be torn away from the structure. All of the materials, down to the screws holding everything together, were chosen to withstand storms, the men told the Times. Lackey and King did not say what it cost to build the Sand Palace. Their architect, Charles A. Gaskin, told the Times that building a home to withstand such powerful forces doubles construction costs per square foot. 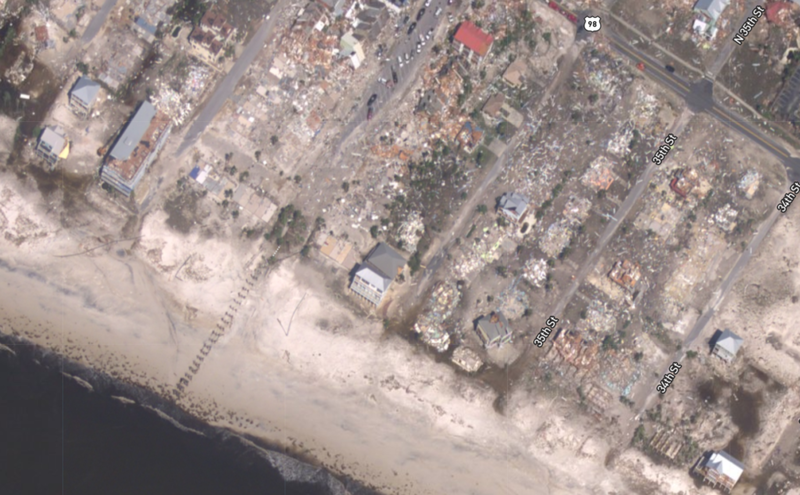 NASA imagery of Mexico Beach, Florida, shows the Sand Palace, center, surrounded by debris from destroyed buildings. Their efforts to build a resilient home paid off. In NASA imagery showing the region after the storm, the home can be seen standing nearly alone, surrounded by debris from other buildings that were less fortunate — or less solidly constructed. The Sand Palace, too, did not emerge from the storm entirely unscathed. On Facebook, Lackey’s wife Heather Lackey announced Sunday that the ground floor of the building and the exterior stairs leading up to the second floor were gone. The storm also broke two windows and drove water into the structure in several spots. The Times reported that the building lost siding as well, though breakaway walls minimized how much the wind could rip away. However, the damage was ultimately so minimal compared to other buildings in the area that by Sunday the home had become “somewhat of a staging area for news and search and rescue and relief workers,” Heather Lackey wrote on Facebook.